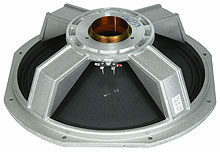 Field-replacement baskets are a standard feature of Peavey's speakers. It takes as little as 5 minutes to change out a Peavey designed and approved replacement basket and you are back in business. If you ever get a speaker re-coned from other companies, it can be a rough experience. First you have to find a box and ship the speaker back to the company then wait 6-8 weeks to get it back. And the speaker may never sound the same. - Unpacked Weight: 6.50 lbs. - Unpacked Width: 16.75 in. - Unpacked Depth: 18.25 in. - Unpacked Height: 6.6250 in. - Packed Weight: 7 lbs.